A Product Breakdown Structure helps us to answer the question, “what are we trying to build?”. They may look identical to a Work Breakdown Structure, but rather than focusing on activities, they focus on what is the product itself. 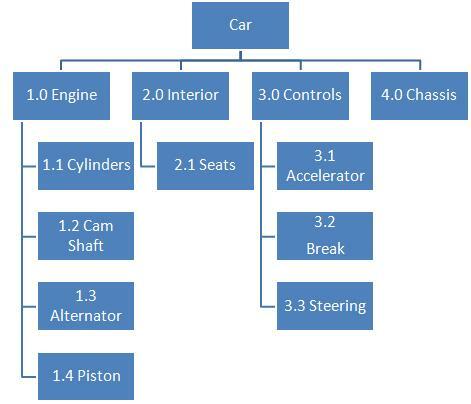 In this diagram you can see that a car is made up of four products: engine, interior, controls, and chassis. You can also see that the engine has four sub-products, whilst the interior product has just one. This example is obviously very simple, in reality we would break down each product to define it completely, that is, you can’t break the product down any further. Note that if our PBS described all the work that needed to be done to build the car then it would also be a WBS. You can think of PBS as being a subset of a WBS. Examining the example again, you can see that the PBS does not show sequencing, however, for many simple Product Breakdown Structures the sequencing can be implied. In most real world examples, the PBS will be far too large to fit into a single diagram, so you’ll have to use an indexing system (or just a spreadsheet) to how where all the different files are located. Step 1: Instruct everyone present to think about all the products they can which need to be created, and to write each one onto a Post-it note. Step 2: After a set amount of time (perhaps 20 minutes) ask the team to place all the post-its onto a wall or board. Step 3: Cluster similar post-it notes together to form groups. Step 4: Remove any duplicates and clarify where there are overlaps. Step 5: Repeat from step 1, using the post-its on the board to prompt people to think of new products. How many times you iterate through this loop will depend on how complex your project is, with more complicated projects obviously requiring more iterations. Once you have all the products defined above, create the PBS as a team. A Product Breakdown Structure helps us break down the product we are aiming to build into all its sub-products. 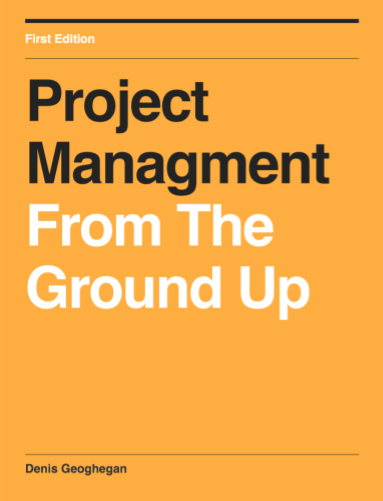 They help ensure we have defined all the products and sub-products which need to be defined, and once completed they provide a great way to communicate what the product is that the project or program will produce.